Anthologies which wrap up the year's 'best' are always greatly anticipated. We want to be reacquainted with our favourite poets, see what sort of spin they've taken on our world during the past twelve months. But of greater interest is often the introduction to new writers. We're curious if the poets who have recently found their way into small press publications have made the cut. Have they stamped their name (and the name of the more obscure journals) on literary history alongside the major players? Will they become the next Big Things? After reading this year's University of Queensland Press Best Australian Poetry anthology, my answer to both of those questions is, sadly, no. 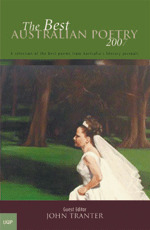 Perhaps this anthology should have been called The Best-known Australian Poets, as it features so many of the old names. I counted only five poets whose bios either claimed a first collection was on its way or did not point out a published collection at all. It would be easy enough to counter my observation with: 'but that points to the fact that their work simply isn't up to publishable standards, hence the rejection from the 'best of' anthology'. And my answer to that would be: 'rubbish'. I am inclined to believe that guest editor John Tranter did not search widely enough for the 'best'. The journals represented in the anthology are the heavies, the standards, the prized and the highly respected; and too often it is the name, rather than the poem, which is being published. There are no minor or emerging journals included in the index, nor are any of the poems pulled from anthologies where many new writers get their start. This is why I found myself disappointed and frustrated with the book's overall selection. It's handy to categorise an anthology into 'like subject matters' but this is an anthology of varied themes, emphasising the impulse for originality in the accomplished poet as well as in the perceptive editor. There is, however, a small sense of the same-old same-old in tone; it is an extremely measured collection. It seems to lack freshness, that spark one would expect from an anthology that highlights 'the best' in Australian poetry in a single year. Aside from the contributors' notes in the back of the book, nothing jumped out at me. While some readers find detailed meanings of a poet's work to be unwelcomed insight (i.e. poetry belongs to the reader, so let the reader interpret the poem the way she sees fit), I think it works in an anthology of 'the best'. These poets have earned our respect. They have paid their dues and should be allotted some space to indulge themselves in their cleverness. S.K. Kelen, for example, writes of 'Dance': 'a cute triple-haiku, sub-sonnet with double carburettors and fins attached, employing iambic pentameter with kick, internal, line-ending, full and half-rhymes. Intriguing envoi, a bit of fun, perhaps'. The poets should be allowed to enlighten readers, for how are we to know of Jennifer Harrison's tryst with Lacan's Law of the Father and Jorge Luis Borges' The Book of Imaginary Beings? I tend to view this section of the book as a learning tool; something to point out my inadequacies in always knowing what I'm on about. For instance, I thought Charles Higham's 'Years Ago' was simply a poem that relied on image upon meticulous image, when it actually stemmed from ghosts that either he or one of his friends had encountered. This sort of thing could be said to distract from the poetry (as readers might find themselves flipping back and forth between poem and meaning) but I find it fascinating and worth the rummaging. There are many poems in this collection that don't need any clarification – the story behind the poem is contained in the poem – and perhaps that's a sign of the truly adept poet, but I'd like to think that these poets are our heroes (for the year, anyway) and these poems are their songs. So I suppose, in wanting to know what inspires them, how they write, what level of humour or seriousness they place upon their craft, I have labelled myself a groupie. Not a bad gig. This entry was posted in BOOK REVIEWS and tagged anthologies, john tranter. Bookmark the permalink.